We are loving Hogarth’s series of Shakespeare retellings! 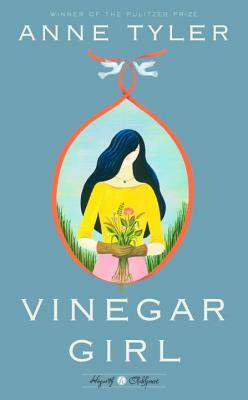 This is Pulitzer Prize winner Anne Tyler’s contemporary take on Taming of the Shrew: Kate Battista feels stuck. How did she end up keeping house for her eccentric scientist father? Dr. Battista has other problems. He is on the verge of a breakthrough. His research could help millions. There’s only one problem: his brilliant young lab assistant, Pyotr, is about to be deported. When Dr. Battista cooks up an outrageous plan that will enable Pyotr to stay in the country, he’s relying – as usual – on Kate to help him. Kate is furious: this time he’s really asking too much. But will she be able to resist the two men’s touchingly ludicrous campaign to bring her around? A dazzling, edgy, laugh-out-loud memoir that reflects on writing, drinking, dating, and more. Kim Addonizio is used to being exposed. As a writer of provocative poems and stories, she has encountered success along with snark: one critic dismissed her as Charles Bukowski in a sundress. (Why not Walt Whitman in a sparkly tutu? she muses.) Now, in this utterly original memoir in essays, she opens up to chronicle the joys and indignities in the life of a writer wandering through middle age. “Clean Room by Gail Simone and Jon Davis-Hunt is currently my favorite comic book being published by DC/Vertigo. A Cronenbergian horror story centered around Astrid Mueller and her Scientology-esque cult, it is brutal and violent and, like the best television shows, has been jonesing for the next chapter in the story. So if you haven’t been picking this book up monthly, here’s your chance to binge read the first six issues. Gail Simone really hit this one out of the park and DAvis-Hunt’s art is just beautiful. I cannot recommend this enough.” -Joe T.
Two novellas playfully chart the aftermath of two very twenty-first-century romances. In “Days,” a woman in her late thirties records her life in a series of lists, giving shape to the tumult of her days–one moment she is eating an apple, the next she is on the floor, howling like a dog. As the details accumulate, we experience with her the full range of emotions. In “Minna Needs Rehearsal Space,” a novella told in headlines, an avant-garde musician is dumped via text message. So Much for That Winter explores how we shape and understand experience, and the disconnection and dislocation that define our twenty-first-century lives, with Nors’s unique wit and humor. In this cover version Shakespeare’s The Winter’s Tale, we move from London, a city reeling after the 2008 financial crisis, to a storm-ravaged American city called New Bohemia. Winterson’s story is one of childhood friendship, money, status, technology and the elliptical nature of time. Written with energy and wit, this is a story of the consuming power of jealousy on the one hand, and redemption and the enduring love of a lost child on the other. Previous Post JUST BOOKED! Sarah J. Maas!